I cannot speak for everyone, or anyone but myself really. But my anxiety has me constantly seeing/believing the worst case scenarios constantly. At a stop light, if a car is approaching I think they’re not going to stop and rear end me. I’m 20 something years old and I still don’t like the dark. I always fear that someone is lurking in the dark (this stems back to my childhood and my brother thinking it would be funny to always scare me in the dark). Going to a big store at night alone is especially difficult because you hear all those stories about people getting robbed or attacked. Growing up, I never really had an active imagination. But ever since anxiety reared its ugly head, my imagination has gotten quite vivid. One thing I have learned is that when my anxiety takes my fears and magnify’s them by like a million. I need to rationalize. Step back, take a moment and assess what is really happening and what i’m blowing out of proportion. Am I really in any real danger? I’m not perfect, so sometimes I forget to step back. This allows my anxiety to run rampant. Do you forget to take a step back? Do you feel like you’re always being a pessimist? 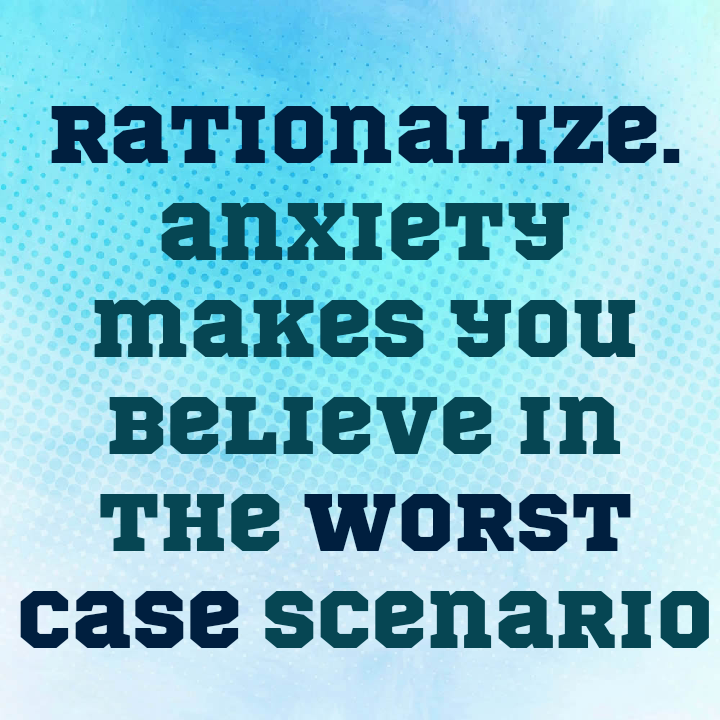 Leave me a comment and tell me how you rationalize your anxiety.